We hadn’t got time to visit all the museums and galleries in Innsbruck (there were many to choose from) but we were intrigued by the sound of Das Tirol Panorama (The Tyrol Panorama) so headed out to the southern end of town to take a look. Here we moved forward from the earlier Hapsburg castles and palaces we had so far visited, to the 19th century, in particular the life and times of the Tyrol region during the Napoleanic Wars. Das Tirol Panorama is a giant painting (actually 27 individual paintings on canvas). These paintings are joined together and set up in a display, which goes all the way round the room. It gives the viewers a 360 degree view of Tyrolean history by commemorating the 3rd Battle of Bergisel in August 1809, between the Tyrolean patriots and the combined forces of the Bavarians and French. This confrontation was one of the Tyroleans many attempts at wresting control of their land back to Austrian rule and on this occasion they successfully drove their enemies back and retook control of the Tyrolean capital, Innsbruck. Their leader Andreas Hofer, who was born in 1767 near Sankt Leonard in the South Tyrol (now San Leonardo Italy) was hailed a hero and set himself up as the self-styled leader of the Tyrol region with the blessing of the Austrian Emperor, Francis 1. Ultimately the Austrians were defeated and ceded the Tyrol to the French who hunted down and captured Hofer. He met his end near Mantua in 1810 where he was executed under orders from the French. Hofer is still revered today as a folk hero of the Tyrol region and his tomb now rests in the Hofkirche, the church of the Imperial Palace in Innsbruck. In addition to the Panorama, the museum also houses the Kaiserjaegermuseum (The Museum Of The Tyrolean Imperial Infantry). This display links in to the military history during the times of the uprising and there is also a section called “Showcase Tyrol”, which explores the culture, lifestyle and values of the Tyrolean region from this period and onwards. I was able to take some photos but since I wasn’t doing my blog then, you will have to peer past Monsieur Le Chic and yours truly to get an idea of the scale of the Panorama! We did feel as though we could be in the midst of the battle and whilst some of the exhibits and explanations of the history were quite complicated to follow (even in English!) the Panorama was a real highlight. For more details of museums in Innsbruck and entry fees head here! The old entrance to the museum. The entrance has now been relocated round the corner. Audio guides were available in several languages including English! The Panorama was painted by a team of artists under the direction of a Munich based landscape painter, Michael Zeno Diemer (1867-1939) and was first exhibited in Innsbruck in 1896. It was relocated to its present location in Bergisel in 2011 and now resides near the site of the original battle! 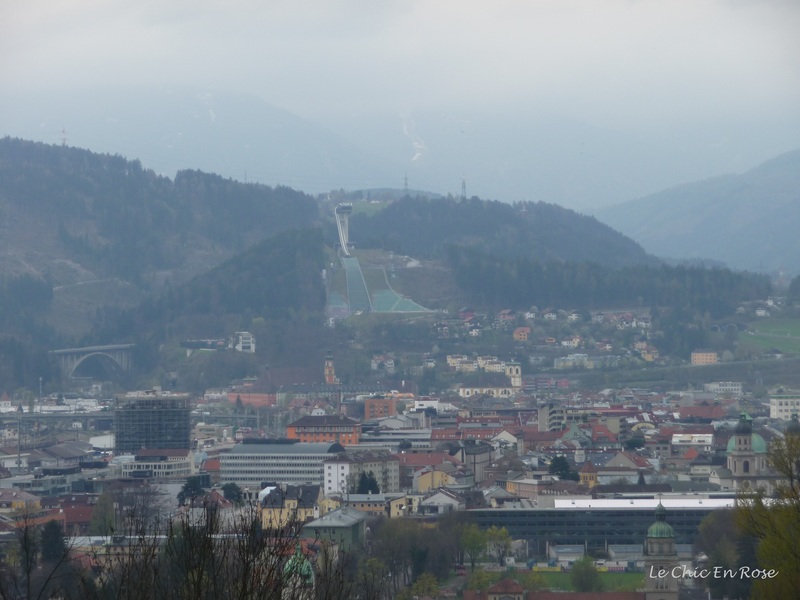 If museums and history are not your cup of tea you can also pay a visit to the site of the Innsbruck Ski Jump, which is also located in Bergisel. One of Innsbruck’s other main claims to fame is its close association with the Winter Olympics, which were held here in 1964 and 1976. Innsbruck has also twice hosted the Winter Paralympics and also the inaugural World Youth Winter Olympic Games in 2012. There are so many pretty little towns and villages dotted around the Tyrol! One pleasant April day when the rain stopped and the sun shone throughout, we caught the train from Innsbruck and went east towards the Kitzbuehl area. We had a very enjoyable lunch in a little cafe in the main square of St Johann In Tirol. A major drawcard for tourists with its abundance of skiing facilities and hiking trails, it was between the summer and winter seasons when we visited and the lovely old buildings were basking in the sun. It was a quiet and dreamy place out of season and we could get a real feel for the beautiful Tyrol, its daily life and its proud heritage! We had lunch and drinks at one of the little cafes, which must be buzzing in high season! St Johann is in a major valley basin – 3 rivers join here and flow towards Bavaria as the Tiroler Ache! What a pretty post, Rosemay! Austria really is delightful, isn’t it? I have fond memories. There is a Panorama of similar scale in Wroclaw, in Poland, of a battle scene- the first I had ever seen of this kind of thing. It will reside somewhere in my posts and I will dig it out if you’re interested. I would love to visit Innsbruck some day. Thank you for bringing Das Tirol Panorama to my attention. It sounds like an intriguing bit of history represented through art. Interesting post. The town where the 1932 and 198o Olympics were held, Lake Placid, is very close to where I live. You can go to the top of the ski jump and look down the ramp–I cannot even fathom having the nerve to ski off that! Your photos are great and I love the concept of the 360 degree panorama. How adorable Photos You presented. I enjoyed every one of them. Thank You. Hi Rosemary! Seeing this pictures bring so many nice memories from the two times I have been in Austria. The beautiful typical houses and the atmosphere of a winter sport city. I really enjoyed this post as well! And hope that I will visit Innsbruck one day as well, now that I have so many tips on what to see there. I’ve been loving these Friday trips to Innsbruck Rosemary – another great one. The panorama museum sounds great – what a fantastic way to view the history. I’ve been to the ski jump in the dim and distant past (well before digital cameras) you got a great shot!! St Johann looks gorgeous too, so much to see and do in this area I am tempted so much to go back!! As always Rosemary, such beautiful imagery. Like something out of a story book I know where I am going when I finish sailing! In the meantime, I will continue to live vicariously through you. I love the paintings on the house walls ! It is so nice ! I went to Strasbourg many years ago I do remember the houses reminded me more of Germany though I can’t remember if any of them had painted frescoes or not. Strasbourg is really not far from southern Germany though! I’ll go and read up on that its over 30 years ago since I was last in Strasbourg!! I was a very young backpacker at the time! I have a question regarding backpacking. I’ve read something about “French shopping” in Australia, and I was quite shocked. Is it true ? Not sure quite what this is Gin but there were some reports a while back of French backpackers causing trouble and in particular shoplifting hence the expression “French Shopping” Is that what you were referring?! Yes ! Apparently there are a lot of French backpackers stealing food, and now, french speaking people are not welcomed in many places. Is that true ? Thanks Pauline yes it is just delightful! Very easy to take nice photos here too 🙂 Hope you’ve survived the cyclone intact! It certainly was impressive Mitzie and Innsbruck is very attractive 😃 I think th Panorama was housed in a different location when you visited too so maybe was not as well publicised!